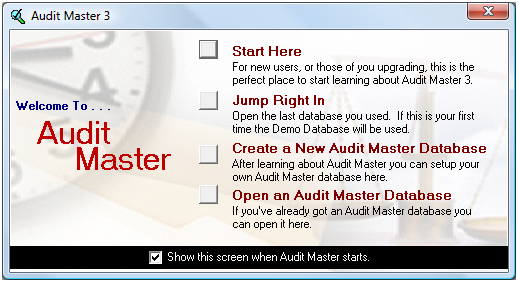 By default, some users choose not to display the “Welcome Screen” each time Audit Master 3 is launched. The “Welcome Screen” is shown below along with the checkbox option to not display it each time the program is opened. Removing the check mark from the “Show this screen when Audit Master starts” option will remove the ability to see this intro menu each time a user opens the program. 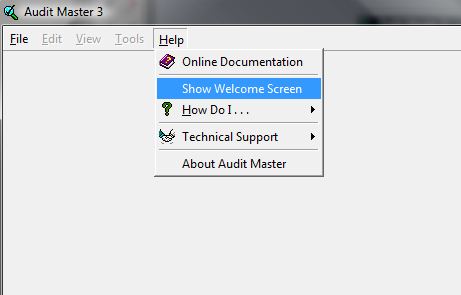 Users may opt to re-enable the “Welcome Screen” via the Audit Master 3 “Help Menu” as shown below. Simply click on the “Help” option at the top, of the program, when the dropdown menu opens, click the “Show Welcome Screen” option to re-enable the “Welcome Screen” after opening the program.